In an exclusive interview with Iwacu, Zachary Muburi-Muita, Executive Secretary of the International Conference on the Great Lakes Region-ICGLR, returns to the issues of concern within the region. Among other things, he gives his opinions on the accusations and counter-accusations between Burundi and Rwanda, tensions between Kigali and Kampala, the request by Burundi of an extraordinary summit on conflict between Rwanda and Burundi as well as the 2020 elections in Burundi. Gitega accuses Kigali of being behind the destabilization of the country since 2015 and Kigali accuses Burundian authorities of supporting the FDLR rebel movement. Based on facts, what is your opinion on that? It is true that there have been accusations and counter-accusations between these two countries and the ICGLR is well placed to analyze them when they occur. We have an Enhanced Joint Verification Mechanism-EJVM whose office is based in Goma in DRC and is composed of military experts from all ICGLR member states. There is also the Joint Intelligence Fusion Center based in Goma. It is an office composed of intelligence experts from all Member States. Their job is to collect intelligence where there are accusations and counter-accusations. They present their report to intelligence chiefs. They conduct investigations when there are accusations and counter-accusations, particularly cross-border incursions or the activities of a rebel movement. They are invited by a Member State and produce a report that is given to the Defense Ministers of the member states of the organization. What were their conclusions ? 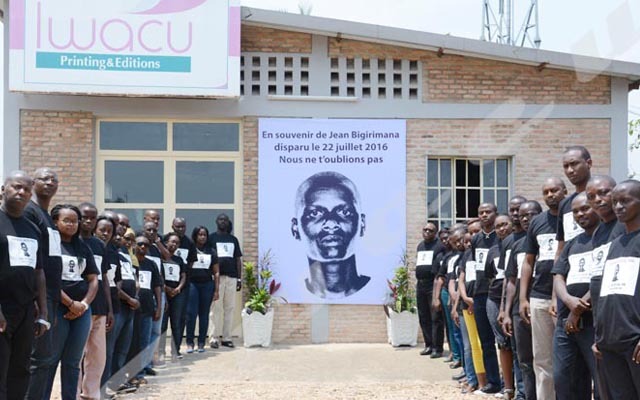 In this case, the EJVM was charged with investigating accusations and counter-accusations between Burundi and Rwanda and submitted its reports. We are now waiting for political action. The Burundian government continues to request an extraordinary summit on the conflict between Burundi and Rwanda. Does ICGLR support this request? If yes, what are the steps already in progress? Of course, if a Member State requests an action, the secretariat must support it. We are here to implement the wishes of member states either individually or collectively. ICGLR is a political mechanism created to promote good relations between the Member States of the region. Burundi’s request has been submitted to the current president of the ICGLR, who is the president of the Republic of Congo. We expect that the authority will convene a meeting on this. If it is a summit, it is the president of the organization who has the authority to convene it. However, as the Secretariat of the ICGLR, we support this wish and it has been taken to the current chair of the organization for action. Last July, Burundi government accused Kigali of letting its military airplane fly over the Burundian territory. Has the ICGLR investigated that? Yes, this is one of the incidents that were investigated by the Enhanced Joint Verification Mechanism in Goma. Military experts came to Burundi. They went to the border area and also went to Rwanda to investigate this particular incident. They produced a report that was submitted to the Defense Ministers. We hope that this issue will be put on the agenda of the session to be held over the next two months. An experienced team like the EJVM will determine whether an incident was done by mistake or was deliberate, and it is up to the defense ministers of the member states of the organization to decide. And the reports produced by the EJVM are highly considered. Rwandan authorities accuse Kampala of supporting Kayumba Nyamwasa’s RNC opponents and Ugandan authorities in turn accuse Kigali of espionage. What are the current steps for the normalization of their relations? We are aware of those accusations and counter accusations between Rwanda and Uganda and it is a very sorry situation indeed because any rising of a political tension between member states is saddening. ICGLR exists to promote good political relations. When there are good political relations, it is possible for trade to go on and with trade, there is wealth creation and that means the citizens of the region lead better lives. The aim of the regional organization is to facilitate the free movement of goods and people. Thus, because of this deplorable situation, the Chair of the ICGLR sent the Foreign Minister of the Republic of Congo to Kampala and Kigali to meet the authorities of these two countries. The ICGLR has done that initial intervention and behind the scenes, there is a lot going on to improve the political relations between Rwanda and Uganda. None of these countries has called upon us as a secretariat of ICGLR to investigate any of those claims. We only act when one of the member states invites us to go and investigate certain accusations or counter-accusations. We have not been invited and have not been onto the ground but at the political level, the current ICGLR chair has made those initial steps to talk to the political leadership in both countries towards normalizing and improving the bilateral relations between them. Recently, the Kenyan President Uhuru Kenyatta has visited Uganda and Rwanda. Was the aim of his visit to find a solution to the tense relations between the two countries? In addition to belonging to the ICGLR, Uganda, Rwanda and Burundi are members of the East African Community (EAC). Therefore, there is the overlapping membership of EAC and ICGLR. EAC is a regional economic community. When there is the deterioration of political relations between member states, this impedes trade on both sides. President Kenyatta has been to Kampala and Kigali, and at the moment I’m talking to you, President Museveni is in Kenya. Their discussions focus on many other issues such as the development of infrastructures, the facilitation of free movement of goods and persons, etc. But of course, such cases of political tensions would also be on the agenda to improve the livelihood of the population of the region and this cannot be done whereas there are bad relations between member states. Although ICGLR is doing its part, the EAC as well is making its intervention because regional integration cannot be promoted and no infrastructural development can be if political relations are deteriorated. Seeing the deterioration of relations between Burundi and Rwanda and Rwanda and Uganda, what would you suggest so that that the situation normalizes again? It’s a sad thing that we have those incidents of deteriorated political relations not desirable at all. Again, the whole reason for ICGLR existence is to promote good relations. We have come a long way from the years leading to the ICGLR establishment. Some countries were openly at war with each other. That time was referred to as Africa’s third world war. Several countries had armies in DRC fighting for or against the governments. Since the founding of the organization, although we have these incidents of bad relations, we don’t have any country that is openly at war with another. From this perspective alone, it’s a big achievement that the relations between ICGLR member states have been improved a lot. In one year, Burundi will hold elections. What message can you give to the Burundian political class? We have several countries in the ICGLR which are going to hold elections and elections all over the world are a very competitive exercise. We call Burundian politicians as well as those of other countries, especially in the run-up to the electoral period, to place the country and peoples beyond political differences. They must not sacrifice the well-being of the nation and the people for the sake of political differences. No matter how big the differences may be, they should not be put above the country. If for instance you look at Kenya, my country of origin, through President Kenyatta and the chief of the opposition Laila Odinga who is the former prime minister, you can see that even the biggest enemies can come together, shake hands and put the national interest beyond everything. Furthermore, Ethiopia and Eritrea have been big enemies for 20 years and tens of thousands of people lost their lives in wars that opposed the two countries. But now, the leaders of both countries have turned the page and decided to put their countries first and this is going to be good not only for the two nations but also for the region. Another example is the peaceful transition in DRC, which immediately promises a positive impact on the entire International Conference on the Great Lakes Region. What message can you give to the youth? I call on the Burundian youth to conduct themselves as patriots, to behave responsibly during the election period, avoid being manipulated by negative forces and be agents of positive change and ensure they are at the forefront of building a solid future. In all countries, during the election period, politicians sometimes use young people. The youth must avoid any activity that may divide them. They must stay positive and ensure they take part in activities aimed at building a solid nation. I urge them to be agents of positive change so that their country can compete with its neighboring countries in the EAC or in the ICGLR. Have you got a particular message to the media? I call on the media to ensure they are not an instrument of anybody. They should be patriotic and objective in their profession. They should also help in building the country because we have seen instances where the media was used to light fire by not being objective especially in the run-up to the elections. Media should not burn their countries so that they can sell or get more famous. When fire burns, it does not discriminate that you are on this or the other side, that you are a journalist, a diplomat or any other personality. It burns all of us. We should ensure we all lessen conflicts through objective engagements to build our countries. What is the ICGLR ? The creation of the International Conference on the Great Lakes Region in 2006 is the result of recognition of the regional dimension of conflict and the need for a joint effort to promote peace and sustainable development in the region. The ICGLR comprises twelve member states, which are Angola, Burundi, Central African Republic, Republic of Congo, Democratic Republic of Congo, Kenya, Uganda, Rwanda, Sudan, South Sudan, Tanzania and Zambia. ICGLR’s main programs include Peace and Security, Democracy and Governance, Economic Development and Regional Integration.